Our Aquatic Therapy Program offers an alternative form of rehabilitation and can be used in conjunction with other traditional outpatient therapies. The pool is an environment uniquely suited to facilitate the healing of neurological and musculoskeletal problems. In the buoyancy of water, people can exercise comfortably and become stronger while gaining mobility in their body and limbs. 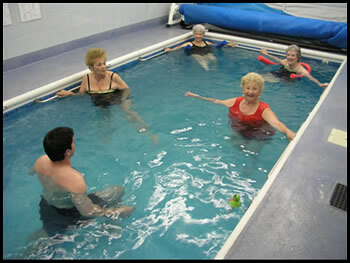 Aquatic therapy exercises are designed specifically to improve flexibility, balance, cardiovascular function, and strength. Who is the program right for? Ask your therapist or doctor about the Aquatic Therapy Program to see if it's right for you. A physician's referral and an initial physical therapy evaluation are required before beginning this program.